Welcome to the Ultrasound Leadership Academy (ULA) summary blog series. This week, we summarize aorta ultrasound. The ULA is essentially an online advanced ultrasound education experience put on by the team from Ultrasound Podcast which brings cutting edge learning to emergency medicine personnel through a variety of interactive platforms including video lectures, google hangouts with experts, simulation, live conferences and real time scanning with a pocket-sized ultrasound device known as a Vscan. The elderly patient presenting with a nonspecific complaint such as weakness, lightheadedness or dizziness is the bane of our existence as an EM doc. We know that this may just be a sign of growing old, or not getting enough sleep from the night before, but there are so many BAD things that could be going on and it is our job to not miss these elusive diagnoses. That being said, aortic aneurysm is something to always keep on the differential, especially in a patient with previous smoking history. In the right patient, performing a simple aortic ultrasound can help you to diagnose an aortic aneurysm or a dissection and save a life. Aortic ultrasound is effective and fairly easy once you understand the anatomy and technique. 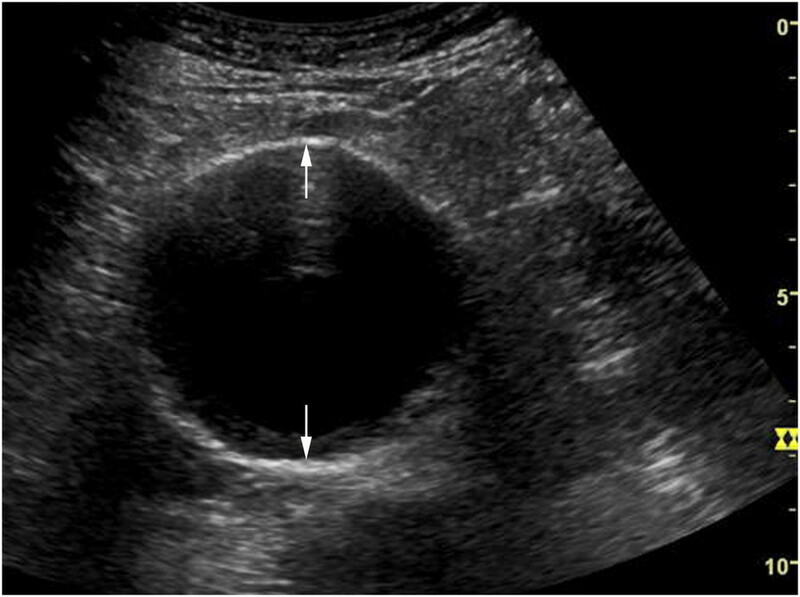 Studies have suggested that the sensitivity of our point of care bedside ultrasound approaches 99% for abdominal aortic aneurysm (AAA) . With such a excellent sensitivity and a high prevalence of AAA in specific patient populations ( 10-15% in men who smoke >65), this is a scan that you should become familiar with. Is there a AAA? Meaning is the aorta diameter > 3 cm at any point along the entire abdominal aorta. Remember, this is point-of-care ultrasound. Have a focused question and use your ultrasound to answer that question. You will need to scan along the entire aorta. This means scanning from the xiphoid process to approximately the level of the umbilicus, which is where the aorta usually bifurcates. To call your aorta exam complete, you must see this bifurcation and the iliacs as aneurysms can lurk here. For a more in depth discussion of aorta anatomy, check out the Geeky Medic post here. Two types of aneurysms to be aware of, saccular versus fusiform. Probe: Curvilinear, probe marker to patient's right side as per standard. Starting at the xiphoid process, obtain transverse views along the aorta, including proximal, mid, distal and bifurcation/iliac vessels. At each of these locations you will be measuring the maximum diameter of aorta from outer wall to outer wall. Every transverse cut through the aorta will always look slightly different as you catch different vessels moving in and out of the screen. The important point to focus on is the vertebral body. This structure labeled with a V above has a hyperechoic anterior border with shadowing behind it. Once you find this, you know your aorta will usually be just anterior to this and slightly to the right of the screen (your patient's left). It is also useful to obtain a longitudinal view of the aorta in its long axis though measurements should not be taken from this image. Try using color doppler to look for pulsatile flow. Look to see if the vessel runs into the right atrium, that is the IVC. The aorta also has a slightly thicker wall than the IVC and runs at a steeper angle. I cannot stress outer to outer wall measurement enough. Do not be fooled by intramural thrombus as seen above. Normal is 2 cm, but anything over 3 cm equals an aortic aneurysm. Bowel gas is your enemy and will obscure your view, the key is pressing hard enough and long enough. Apply constant pressure using your probe until bowel gas is pushed away. Use your hand holding the probe to increase the surface area that you are compressing on the patient. This will promote moving more bowel gas out of your view. Avoid measuring aorta diameter in the long axis view. You can potentially miss saccular aneurysms coming off laterally and you can also tangentially cut through the aorta and obtain a measurement that is less than the true diameter of the aorta. Yet another elusive diagnosis. The classic tearing and ripping chest pain with radiation to the back is usually not the case. It can present as syncope, chest pain, stroke, vague neurologic symptoms, back pain or even nausea. Aortic dissection is not only 3 times more common than a AAA, it is also deadly, with a mortality of 50% at 24 hours. It is therefore our job as front line medical providers to have a high suspicion for this diagnosis and be ready to scan some aortas. The scan technique is the same as with aortic aneurysm. You are obtaining transverse cuts along the aorta from the xiphoid process to the iliac vessels. This time you will be focusing on motion within the aortic lumen. Occasionally you will be able to see a true hyperechoic flap within the lumen, but if you are seeing any sort of motion with the lumen that is on cue with the heart beat, you should be concerned for dissection. And if you do see a flap or motion, you should get aggressive with BP control and call your surgeons. A nice recent review on acute aortic dissection at EM Docs can be found here. If you scan the aorta, you will save lives! It's not a hard exam, practice and persistence will go a long way. More on Lung US can be found in "Introduction to Bedside Ultrasound," Volume 1 & 2, from Dr. Mallin and Dr. Dawson. If you are interested in purchasing these ebooks for less than $1, visit Ultrasound Podcast Consumables.